How will the Long Winter, Late Spring, and Floods Affect the 2018 Growing Season? Every season in the Ambrosia apple lifecycle plays a part in determining whether we’ll have a healthy crop of big, juicy apples come harvest time. Right now, the leaves are green and the blossoms are falling away. 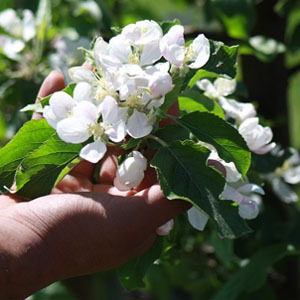 Orchardists are doing a round of thinning to make sure that the trees don’t have too many blossoms (which can create too much demand on the trees). This is generally what’s happening in most Ambrosia orchards around BC, but there can be a big difference between the Similkameen Valley orchards in the south and farms located in the northern part of the Okanagan Valley. We thought we’d check in with a couple of farmers to see how the Ambrosia trees are doing. Raj Bagha of RJ Bagha Orchards in Vernon says that things are looking pretty good in his Ambrosia block. He reports that one section suffered from some winter damage. This can happen when we have a long cold winter like we did this past year. Luckily, it’s just a small section of his orchard because those trees will not bear fruit this year. While we all may have lamented how long winter hung on this year, Raj says it made for a great blossom season. “The weather was great, the climate was perfect, not too wet. It’s really beneficial to have a slow start to spring,” explains Raj. He’s hopeful for a good harvest this year but says we’re not out of the woods yet when it comes to the weather. He’ll be watching the temperatures closely over the next few months. Ideally, he says, we don’t want spring hot spells. Right now the apples need cooler days, chilly nights, and a bit of rain. Farther south in Cawston, BC where Greg Sanderson owns and operates his Ambrosia apple orchard the story is a little different. There have been numerous news reports about flooding in the Similkameen Valley but Greg’s farm has enough elevation for that not to be a problem. Of his neighbours’ farms, he reports that the main issue is rising ground water. He says that those famers are concerned but staying optimistic. As for his Ambrosia apple trees, they’re pretty much on schedule. He reports that his blossoms were only a few days late and there was a nice warm spell where he was able to bring in the bees to do their pollinating work. Now, all he can do is wait and see. He just hopes that the predicted long, hot summer ahead doesn’t lead to a return of the smoke and fires that BC experienced last year. While these two orchard stories are a little different, early signs point to a good harvest that should be pretty much on schedule. We’ll keep you updated as the growing season develops.